Dress up your the back of your rig with a hitch step or hitch cap. Hitch caps add style to your truck or SUV by concealing your receiver hitch. 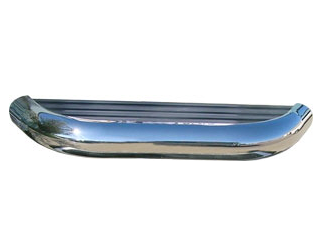 Hitch caps install directly into your receiver hitch hitch and are available in chrome, black, aluminum materials. Mudflaps.com carries Action Accessories Hitch Caps, All Sales, Bully Dog and RBP Hitch Caps. Hitch Steps also install directly into your receiver hitch. Hitch Steps make it easy for you to jump in and out of your truck bed without having to drop the tailgate. Carr hitch steps are top of the line. These steps fold up when not in use and show a cool logo. Mudflaps.com carries Reese, Romik hitch steps, Carr Truck Accessories and Go Rhino Hitch Steps. Action Accessories Hitch Caps are high quality stainless steel with a powder coat finish. These caps are super stylish and come in tons of different styles including American Flag, Horse, Elk, Mud Flap Girl and more. If your looking for the ultimate in hitch cap styling check out Action Hitch Caps. AMI carries the largest line of accessories to enhance your car or truck. Whether you drive a Chevy, Ford, Dodge, Jeep and Nissan you’ll surely to find exactly what you need, by simply searching our product database. Purchase this Bully Dog Hitch Cap from Mudflaps.com for the lowest online price. This Hitch Cap fits all 2" receiver hitches and keeps dirt and debris from building up in your trailer hitch. Secure Online Shopping We are dedicated to delivering a safe online shopping experience. Copyright © 2019 Mudflaps.com. All Rights Reserved.